Many historians have Indian summers, periods of productivity at the end of their careers, when their experience and skills lead them to produce their finest work. 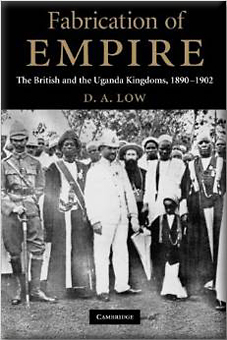 D A Low has been publishing for many decades, illuminating the history of East Africa, of India, and of wider issues of empire. He has also led a busy academic life, including the Vice-Chancellorship of the Australian National University and the Presidency of Clare Hall, Cambridge. Now he has published the book which rounds off a lifetime interest in the British advance in East Africa and, in particular, the agreements they reached with the kingdoms of what was to become the colony of Uganda. These kingdoms appeared to be 'traditional'; their continuing existence under British colonial rule seemed to perpetuate their pre-colonial institutions; and they seemed to symbolise a classic instance of the concept of 'indirect rule'. The reality is somewhat different. In pre-colonial times there were almost thirty chieftaincies in the region to the west and north of what became Lake Victoria. By the time the British had finished with their re-construction of these polities into kingdoms that they could work with, there were only five: Buganda, Bunyoro, Busoga, Toro and Ankole. Of these Buganda was by far the most important, although its earlier history had shown little indications that it would emerge in this position of dominance. That it became the classic East African kingdom was partly because it occupied a strategic position for the Europeans travelling from the East Coast, partly because it became a focus for missionary activity (and conflicts, both with Muslims and between Protestants and Catholics), and partly because it appeared to have institutions that the British could work with. The new colonial power duly truncated this state on some of its borders and greatly extended it at others. Once the so-called Uganda agreement had been signed by Sir Harry Johnston in 1900, other similar agreements were created for the other four states. The route to this apparent consummation of empire in the creation of a new colony was, however, tortuous and fraught with violence and many changes of policy. Low poses three principal questions: why did the British win? Why did 'Uganda' emerge as a separate colony? And why did Buganda become the nodal point of this assertion of colonial power? He also sets out to create a typology of the colonial advance into the region. He divides the dramatic and serpentine events of the late 1880s and 1890s into the period of 'precursors' (the earliest contacts when Africans would have felt little threatened by the Muslims and whites arriving either by the White Nile system or by the route from the East African coast); the beginnings of the assertion of imperial power, often marked by violence and by internal struggles within and between the kingdoms; the 'determining vortex', characterised by the working out of these interactive struggles, sometimes over a period of several years; and finally the 'defining conjuncture', when British authority was finally asserted and symbolised by the agreements. In explaining and detailing these various stages. Low draws on a whole succession of interpretations relating to different forms of indirect rule in the British Empire - and, despite Lugard and his 'Dual Mandate', there was never any clear model - each method was formed by local circumstances. He also considers many of the theories of the spread of empire, including concepts of the official mind and of the turbulent frontier. He draws on South African scholarship to demonstrate the progression from the 'colonization of consciousness' to the fully developed 'consciousness of colonization'. He also examines the Uganda case in terms of typologies of conflict, including 'primary resistance' and 'post-pacification revolts'. He comes to the conclusion that it was 'ground-level imperialism' that offered the prime conditioning factors. It was British individuals in the field, often coping with the exigencies of emergency situations, that formed the imperial outcomes, although they did of course ultimately have to be sanctioned in London. Sometimes, that sanction was prompted by jingoistic outbursts from the British public, as in the key year of 1893. Most importantly. Low demonstrates how so many of the details of the agreements were formed in interactive debates with African authorities. These were not imposed systems. Africans had independent agency and, despite the obvious disparities in power, exercised their own instrumentality in struggling towards the arrangements that they could live with. Nevertheless, the British had 'fabricated' not only a new colony with boundaries that bore little relation to pre-colonial realities, but also froze African states with institutions and borders that had previously been in a high state of fluidity. 'Eabrication of Empire' operated at a variety of different levels. The detailed research which has gone into this book is admirable, and reflects almost a lifetime's work. All events, every conflict, the profoundly interactive debates (between Africans and Europeans, among the many parties to conflicts, and between the 'men on the spot' and London) are closely referenced. This ensures that this is as close to being a definitive account as is possible, although the excess of detail, the descriptions of succession disputes, and the proliferation of names, often makes for tough reading. But the effort to link all of this into a wider imperial framework is very satisfying, even if the methodologies may strike some as more tried and tested than innovative. More recent approaches, for example setting all of this into a firmly environmental context, are relatively absent. But the book ends with a highly readable account of the visit of the Katikiro of Buganda, Apollo Kagwa, to Britain, originally with the intention that he should meet Queen Victoria, later with the idea that, in common with so many others from around the empire, he should attend the coronation of Edward VII. Kagwa's visit has been very well documented. The reception he received and the travels planned for him were intended to impress and they succeeded. This was something more than the display of the conquered in the Roman 'triumph'. Kagwa's treatment, according to Low, complied with African principles of 'honour'. Kagwa would return to Uganda and relate all that he saw in terms of admiration and wonder. Missionaries, educators and colonial officials continued with this work of spreading conviction in the greatness of the British world, both in its domestic and in its imperial incarnations. These were the ways in which the work of the 'consciousness of colonization' was completed. Nevertheless, imperial rule also spread the 'consciousness of nation' in an international world order. Whether the nation should be Buganda or Uganda was a dilemma fought out in the post- Second World War years. That dispute and many of the crises of the early years of Ugandan independence had their origins in the key years examined by Low. All those who worked in Uganda, in colonies elsewhere in Africa, and indeed anywhere where agreements were formed with traditional authorities will find this a fascinating account.